Also where you use the isolater matters too. I don’t feel comfortable opening this up; gave you searched the web for pictures? ProGear I am sure is nice, but it like another $4K US, more then I willing to part with at this stage. Over the weekend I will update further. I have my set tracks that I listen to and will note the differences. Everything is more open, resolving and darker. I like the way this really improved things, especially knowing by a certain percentage my DAC is the weakest link in my system, and now it sounds like an upgrade. Very happy! 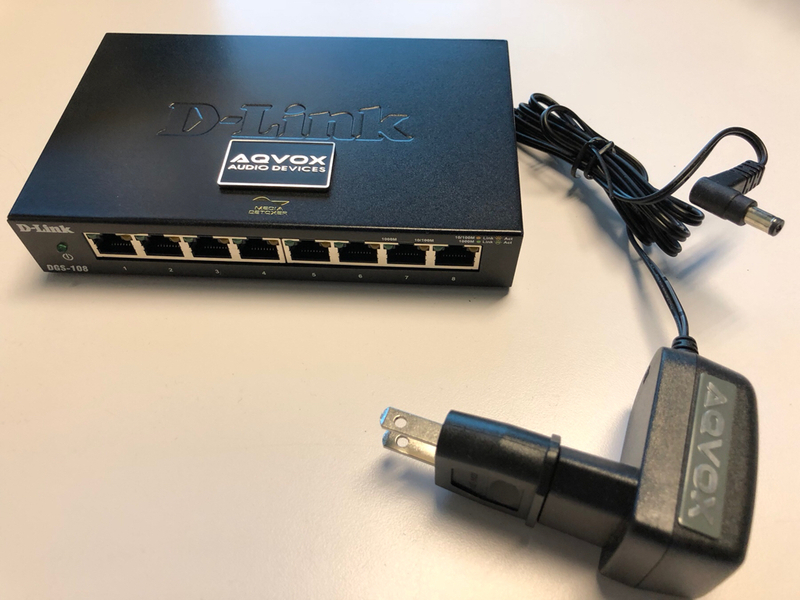 I did some high level research on the subject of Audiophile Ethernet Switches finding they do exist and one in particular, the AQVox SE Audiophile network switch. AQVox is a German company, based in Hamburg beginning in 2003 by a Susanne Candeias. AQVox claims to be first in creating an Audiophile grade switch. The AQVox web-site is what I would call simple, it may take you a minute to get around. Several emails were answered very quickly. Order delivery to Seattle from Germany was in about 7 calendar days. Overall a pleasant experience. 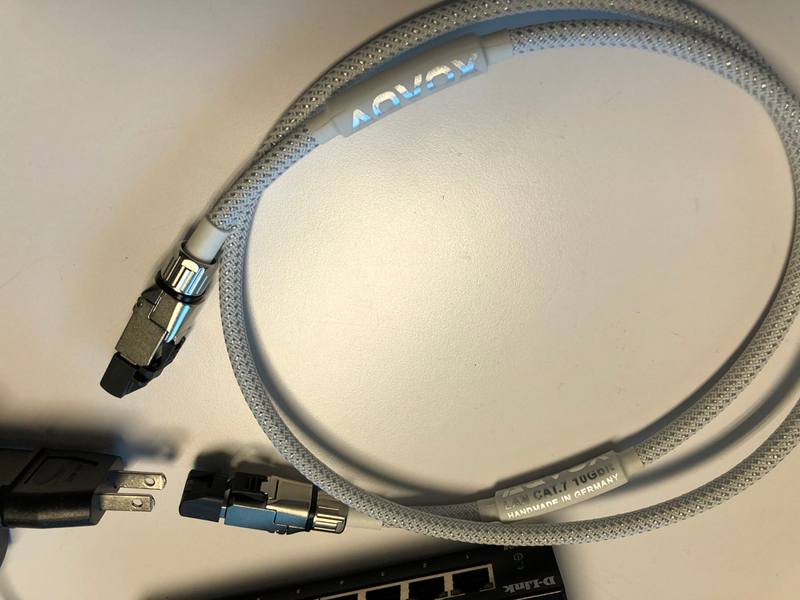 AQVox indicates you will realize the following benefits of a ReClocker, Jitter Reduction, Signal Shaper, EMI Eliminator and a De-Noiser amongst other things. AQVox indicates they stand behind customer satisfaction and offer a 30 day return policy - I don’t know who pays return freight, but I like customer satisfaction, after all who doesn’t? I will not be returning the switch and also purchased a 1.5M AQVox Edge cable and plug jacks. Hookup is basic and they said only to use their power supply as everything is tuned in support of the switch, and avoid using modified power supplies, including ones they offer. Cable management seemed to take the most time. I repurposed an AudioQuest Vodka (not to be confused with the “AQ” in AQVox) between the Mac Mini and the router. I used the AQVox Edge 1.5M Ethernet cable from their audiophile grade switch to the PS Audio Direct Stream DAC with Bridge II. The Aurender N10 is the primary source and connected with the Nordost Heimdell Ethernet from the AQVox audiophile switch. I did this in two waves: switch installation replacing a Netgear GS108 with Audioquest Vodka and then five days later, I swapped the AQVox Edge and Audioquest Vodka Ethernet cables leaving the Nordost in place the whole time to the N10. Upon turning on the system, it was very clear, something good was here. Music noticeably opened up giving way to better resolution dynamics and a airy holographic soundstage with the liquid weight that I like - AQVox indicated it would take 3 days to burn in, and it was already sounding great! 5 days have past as I knew listening would be sparse since family came to town but now have left. They had zero interest in Audio as my family, so once they left, I now had time to see what the heck I just did. The N10 and DAC were powered on allowing the switch to receive and pass signal. Days later, I changed out the Ethernet cables to see how the Mac Mini does and that AudioQuest Vodka Ethernet cable has done added something in sound that was not not there before, not huge but an improvement. I’m doing A/B comparisons by streaming both sources through the AQVox SE. If it were a competition, the Mac Mini now reduces the gap, however the Aurender still reins as champ. But comparing these really was about how both devices benefited from the switch. Both options provide me amazing results as mentioned prior. I have set recordings, and listen for specific sections at specific volumes to see how things compare, it truly sounds like I upgraded my DAC. While the N10 was Champ, If I was aware now what I just achieved I may have held back on the Aurender saving $6400, plus over double in cost after cabling and mechanical grounding and considered a better server than Mac Mini for much cheaper and put my money towards a MSB. Makes me think if I did not do this, and not have done that, I could have done a simpler approach not far off in cost running the Mac Mini or similar, AQVox SE Switch, a MSB Select, and Monos but that’s me, the addicted audiophile, but this is a hind-site statement, and I truly love my system, just second guess the cost of it all. I guess redundancy has its price but offers options in the event of down times. The recent switch upgrade is awesome, but my experience over he last year has built a steady foundation that includes addressing incoming power, distribution, electrical ground and conditioning, using Nordost QRT and Reference Series 2 power, interconnect and speaker, with use of the Ansuz C2 and C for power, DAC and Transport. Equipment floats on mechanical grounding by Ansuz Darkz DTC and Stillpoint Ultra SS, aside from amps and speakers. All equipment is subjective to the environment it is used in. My vote this switch is worth the purchase if your budget allows. First Sound Mark3SI preamp, Altec Lansing 1570B modded by Transition Audio Design and myself, Mojo Audio CAT Server running Win Server 2016 AO HQ and Roon, Mojo Audio Mystic 3 DAC, Linear Solution Ethernet Switch, Custom TT with Vertere Arm, Denon 103R Midas with sapphire cantilever line contact diamond, Allnic H1201 phono pre, Pure Audio Project Trio 10 with performance Solen air core chokes and Mundord Supreme oil caps, Power via 10 awg OFC cord from panel to custom distribution strip, Inakustik speaker and interconnect cables, Genesis Interconnect. 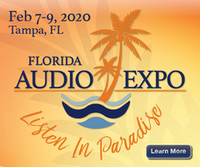 Is that device nearing availability to the public or is yours a sample similar to what Audiostream reviewed? It definitely appears compelling and simple. stuff: Mark Levinson No. 52 pre, Bricasti M28 amps, Oppo BDP-205, Pioneer CT-43, Sony SS-AR1 Speakers, Shunyata Triton V3 w/ Typhon, Furutech Nanoflux/Nanoflux NCF, Siltech TC, Acrolink 7N-PC9700 power cables, WW Platinum Eclipse 7 IC's/Speaker Cables, + an Audioquest WEL IC or two. Nearing completion and improvements from the review sample. Mike, what does it do? Just the Ethernet. Mike how is the DJM testing coming along??? bumping this thread back up. Any more reviews out there?